It's the summer of 1990 and Crystal Beach has lost its beloved, long-running amusement park, leaving the lakeside village a virtual ghost town. It is back to this fallen community that Starla Mia Martin must return to live with her overbearing mother after dropping out of university and racking up significant debt. But an economic downturn, mother-daughter drama, and Generation X disillusionment soon prove to be to be the least of Starla's troubles. A mysterious and salacious force begins to dog her; inexplicable sounds in the night and indescribable sights spotted in the periphery. Soon enough, Starla must confront the unresolved traumas that haunt Crystal Beach. Sodom Road Exit might read like a conventional paranormal thriller, except that Starla is far from a conventional protagonist. Where others might feel fear, Starla feels lust and queer desire. When others might run, Starla draws the horror nearer. And in turn, she draws a host of capricious characters toward her--all of them challenged to seek answers beyond their own temporal realities. 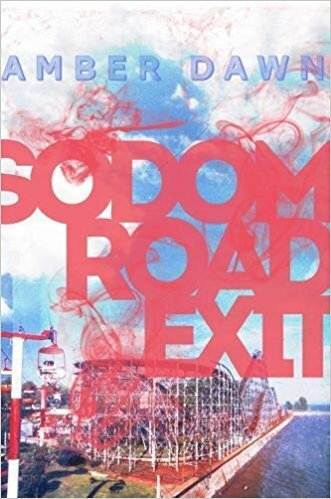 Sodom Road Exit, the second novel by Lambda Literary Award winner Amber Dawn, is a book that's alive with both desire and dread. Not only does this sound like a creepy read with an interesting heroine, but Crystal Beach was a favorite haunt growing up, and I'm fascinated with the idea of exploring its legacy. I love that this story is based on a real place. It does sound creepy, and I'm a little spooked by Starla! Wow, this one sounds great. Thanks for sharing it and I'm pretty sure this is going on my wishlist/TBR immediately! A paranormal thriller sounds like something I would definitely enjoy. Thanks for sharing this one. This sounds like a good book. Good pick! Nice find! I like the idea of a paranormal thriller.